The company challenge gamification framework adds a layer of competition to redundant or prescriptive tasks, ranking individual employees or teams of employees according to gameplay performance. This friendly layer of competition allows different groups within the company to compete against each other, not only motivating employees and increasing productivity, but also making work more fun. The company challenge framework is great for building company motivation. Ideal for companies that already have defined teams, this gamified framework has the ability to not only track job performance of each employee, but also to track the performance of an entire team. 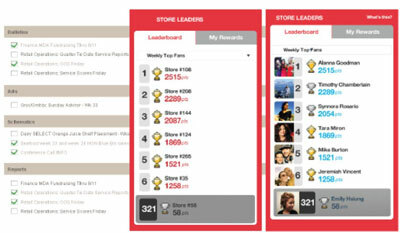 Leaderboards compare individual and team gameplay performance, awards represent successful task completion, and missions act as daily checklists to complete for rewards and status. Sales productivity: Increase it by adding the company challenge gamified framework to CRM systems. This framework lets you create competition for sales and marketing team members, increasing sales efficiency and revenues. Support/call center operations: This framework is good for support and help-desk systems. With competition for support ticketing systems, employees get a fun, game-like experience for closing more tickets. Team performance management: This gamification framework is perfect for teams at large corporations that have specific metrics for success. The framework increases productivity and encourages teamwork with friendly competition. Visualization of progress: Clearly measured game metrics provide actionable feedback. By providing points, leaderboards, levels, achievements, and badges to reward employee tasks, users receive clear feedback about what they’ve achieved and what they need to do to level-up. This visualization of performance status is instrumental in keeping employees engaged and performing. Rewards: Rewards are valuable to all users, whether they’re driven by monetary incentives, privileges, or recognition. Using the company challenge gamification framework, employee behaviors can be set by team and individual rewards.